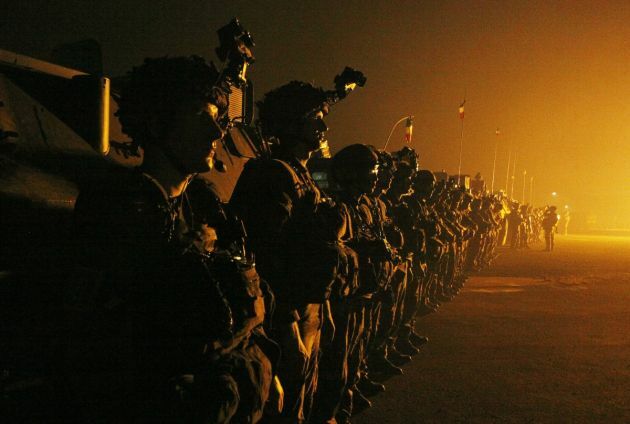 (Photo: REUTERS / Emmanuel Braun)French troops stand at the airport runway in Bangui, December 10, 2013. BRUSSELS/BANGUI, April 30 (Reuters) - European Union peacekeepers took charge of security at Central African Republic's main airport on Wednesday in their first major operation to try and end months of sectarian slaughter. Just ahead of the handover, four people were killed overnight and on Wednesday morning in the capital, the local branch of the Red Cross said. One of the dead, a Muslim, was decapitated, his heart ripped out and his body mutilated, a Reuters witness said. The EU peacekeepers are meant to share the burden of around 2,000 French troops and 5,000 African peacekeepers already in the country who have so far failed to stop the bloodshed. Fighting surged when mostly Muslim Seleka rebels seized power a year ago in the majority Christian nation, launching a wave of killings and rights abuses, said U.N. and aid officials. Mainly Christian groups formed what they called "anti-balaka" self-defence militias who have also been accused of atrocities that have continued even though the rebels stepped aside in January. French troops handed control of Bangui airport over to the EU peacekeepers, who are also commanded by a French officer, Major-General Philippe Ponties, at midday local time, the EU said in a statement. Thousands of civilians have taken refuge in a sprawling settlement of cardboard shacks and tarpaulins beside the airport to escape the violence that rights groups have described as ethnic cleansing and warned may spread insecurity in a fragile region. Many others, including almost all of the city's Muslim population, have fled, U.N. and aid officials have said. Central African Republic, impoverished despite its mineral wealth, borders some of the continent's most unstable countries including South Sudan and the Democratic Republic of Congo. The European Union formally launched its peacekeeping force in the former French colony at the beginning of April after weeks of delays caused by shortages of soldiers and equipment. Only about 150 EU troops have arrived so far. But the strength of the force is expected to continue building until it reaches its target of 800-1,000 soldiers in June, the EU said. The peacekeepers will also eventually move out to secure areas beyond the airport. Countries includingFrance, Georgia, Estonia, Latvia, Poland, Portugal and Spain have pledged soldiers or logistical help. Antoine Mbao Bogo, president of the local Red Cross, said two people were shot dead in Bangui's Third neighbourhood late on Tuesday and gunfire rang out all night. Another two were killed on Wednesday and seven others were wounded in the clashes, he said. Two of those who were injured were local journalists, a Reuters witness said. Angry residents - Christians and Muslims - gathered close to a mosque in a nearby neighbourhood to collect the body of the decapitated Muslim. "There is no security here," said a resident who only gave her name as Petula. "They talk about the Burundian (peacekeepers) but there are not many and why are there in areas of town where there is peace? Here, there are killings." Seleka leaders stepped down in January under international pressure but the peacekeepers and a weak interim government have failed to stamp their authority on the impoverished and landlocked country, which has been riven by political instability and conflict since independence from France in 1960. At least two people were killed earlier this week when a convoy of Muslims fleeing the capital came under fire, days after three aid workers and over a dozen local chiefs were killed in an attack on a health clinic in the north. The United Nations has approved a 12,000-strong peacekeeping mission that will take over from the African force in the country from mid-September.